Freezing oranges and lemons keeps them fresh, preserves convenient portions of citrus for drinks and recipes -- and ultimately saves money. Citrus fruits contain significant levels of vitamin C, folate and antioxidants that protect your cells from damage. Learn how to freeze oranges and lemons properly to preserve their quality and make them convenient to use. Citrus fruits keep for only two weeks in the refrigerator, according to the Clemson Cooperative Extension, so it makes sense to freeze the ones you won't use right away. As with all foods, wash your hands and use clean containers and food preparation surfaces. Cut away any areas of the fruit where the skin is broken. These areas can harbor microorganisms that cause food-borne illness. Wash the whole, unpeeled oranges and lemons with plain water. Don't use soap or detergent, because the fruit can absorb it. If you want to freeze some of the citrus to use for juice, leave the peels on and cut the fruits in half so they're ready to juice. Peel the oranges you wish to eat, and cut them in half or divide them into sections. A popular orange-freezing method involves filling a wide-mouth quart canning jar with orange sections and covering them with heavy syrup made with 40 percent sugar. The same method will work for lemons. 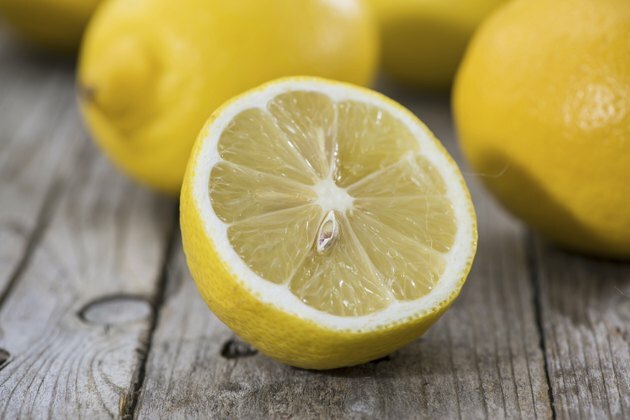 Sugar isn't necessary for freezing citrus, but it helps preserve the fruit's color and texture, according to the University of California at Davis. To cut down on the added sugar, use some of the fruit's own juice or water to pack oranges or lemons for freezing. Leave 1 1/2 inch of head space -- empty space between the fruit and the jar's lid -- to allow room for the citrus fruit and liquid to expand when it freezes. Wad up a piece of waxed paper and put it in the top of each jar to keep the citrus down in the liquid. Freezing the citrus fruit without added liquid is called dry pack. Fill wide-mouth canning jars, freezer bags or freezer containers with oranges or lemons in sections or cut as desired. Leave at least 1 inch of head space if you pack them in canning jars or freezer containers. You can pack the citrus tightly. Pack lemons cut in half and oranges in halves or quarters, depending on how you want to use them. Use only canning jars or freezer jars because the glass has been tempered to withstand temperature changes. Other jars can break when they freeze. Navel oranges become bitter when frozen because of their high limonen content, according to the University of California at Davis. Other orange types have less limonen. Oranges and lemons will keep in the freezer for four to six months at zero degrees Fahrenheit or below, according to the University of Kentucky Cooperative Extension. Raw juices, including orange juice, can carry food-borne illness. People susceptible to such sicknesses should avoid unpasteurized juice, according to the University of Florida Institute of Food and Agricultural Sciences. I Cut a Mango & Its Not Ripe: What Do I Do?